Just like Star Trek has its own Klingon language, Star Wars also has its own, called Aurebesh. This is the name given to what we often refer to as ‘basic’ in the extended Star Wars universe, but when we see it written down, letters don’t look anything like what you’re reading right now. Instead, Aurebesh has its own letters that correspond to the English language. Unlike Klingon, or any other real or fake language for that matter, you will find Aurebesh is very simple to learn. There are only a few extra rules to what English provides, and there are online resources that can help you out. The best place to start is at the Aurebesh learning page, a fan created resource to help you learn the language. There you can see a list of letters, practice exercises, create banners and learn how to use Aurebesh on your desktop. Another good online resource is the Wookieepedia page. There you can learn about the language, some history, and a long series of appearances. The fact is that if you watch a Star War movie, TV series or game, then chances are you will see Aurebesh. In some, especially the cannon media, these letters are meaningful. The creators actually write sensible things, and sometimes even easter eggs for those who go far enough to learn the language. Many episodes of The Clone Wars, for example, include references to pop culture. For other media, especially the fan created stuff, the written text may not make any sense. 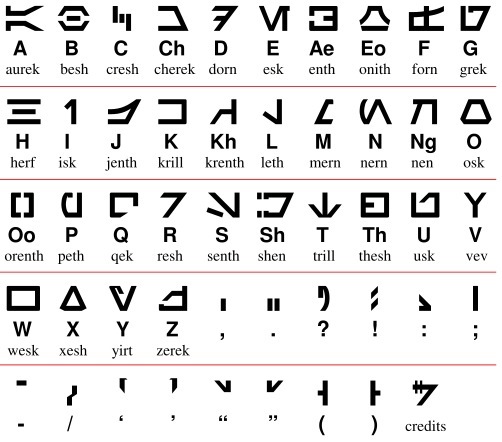 If you wish to learn Aurebesh, a simple way is to just stare at the letters alphabet and learn them. You will see that most correspond to single English letters. In fact there are no different grammar rule, or special phrase to learn. You speak in Aurebesh just like you would in English. The only exception is for some special letters which correspond to sounds. This includes ‘ae’, ‘eo’, ‘kh’, ‘ng’, ‘oo’, ‘sh’, ‘ch’ and ‘th’. These are called digraphs, and are reserved mostly for proper names. To write common sentences, you would typically not use them. Also, upper and lower case letters are not distinguished in Aurebesh, but there are still some ways to capitalize a letter. Sometimes, the letter would simply be bigger than the others. Other times, the letter could be reversed. Aurebesh was invented by George Lucas’ team as part of the greater Star Wars universe so that written text could be included in the movies without having it look out of place. While the public is accustomed to hearing actors speaking English in sci-fi movies, the same can’t be true for written sentences. It has to look alien, and Aurebesh was created to fulfill this role. The name itself means Aurek and Besh, the first two letters of the alphabet, and in Star Wars lore, it was introduced during the Rakatan Infinite Empire. It is the most common language in the Star Wars universe, and the only one to have an English real world translation for us to learn. Click here to find out why it’s cool to like Star Wars now.